Exciting things are afoot in the Rocket City. First Whole Foods moved in to the new Shops at Merchants Walk at 2501 Memorial Parkway SW. Now, Farm Burger has wiggled out a space for itself in the same complex. 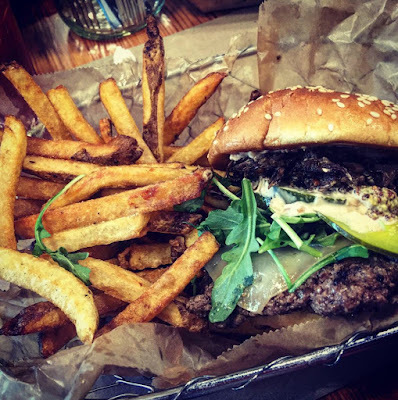 The upscale burger joint promises organic, grassfed, dry-aged, fresh beef and a menu that is chef-driven, seasonal and sourced from local farms. The decor is decidedly low key and easygoing with a farm fresh feel. 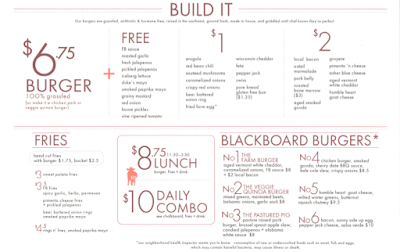 While the concept is simple, the menu is quite complex. I was really glad there was a line, because it gave me time to study the menu. There were so many options! 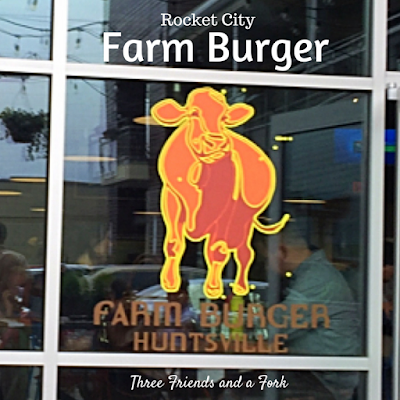 Seriously, you could go to Farm Burger everyday for months and not have the same burger twice. I passed on the snacks of boiled peanuts, fried chicken livers or deviled eggs, although the deviled eggs did give me pause. I am such a sucker for a deviled egg! I also skipped the pot pie fritters and the mac and cheese with pulled pork. 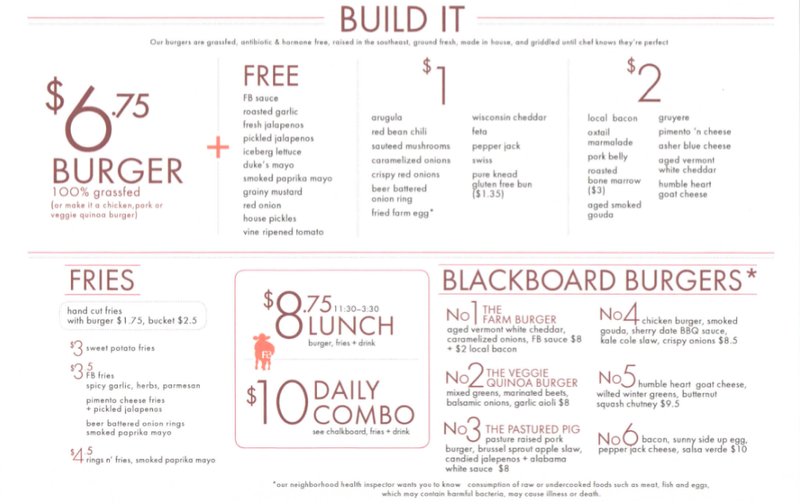 Additionally, I chose to forego the already designed blackboard burgers in favor of building my own burger. Having made that decision, I began to study my burger topping options. They fell into three categories: free toppings, $1 extra toppings and $2 premium toppings. The free toppings included Farm Burger sauce, roasted garlic, fresh jalapeños, pickled jalapeños, iceberg lettuce, red onion, vine-ripened tomatoes, Duke's mayo, spicy mustard, homemade pickles, and smoked paprika mayo. From these, I picked the Farm Burger sauce, spicy mustard and homemade pickles. There were even more extra and premium toppings than free toppings. I settled on arugula from the extra toppings and gruyere and oxtail marmalade from the premium section. Here is the finished product. I was really happy with my choices. The meat was juicy and delicious and my toppings were original and very cheffy. Farm Burger sauce is sort of a spicy homemade Thousand Island sauce and oxtail marmalade is meaty and sweet all at the same time. The arugula was fresh and the homemade pickles added a crunchy punch. The melted gruyere put the whole thing over the top. My burger was accompanied by hand-cut french fries. They were crispy on the outside, soft on the inside and perfectly seasoned. Finally, and this is important, my tea tasted like it was brewed by a southern grandma. It was refreshing, without a hint of bitterness. I will definitely be back to Farm Burger to build another burger masterpiece and, hopefully, try out those deviled eggs. Yums UP! Welcome to the Rocket City!